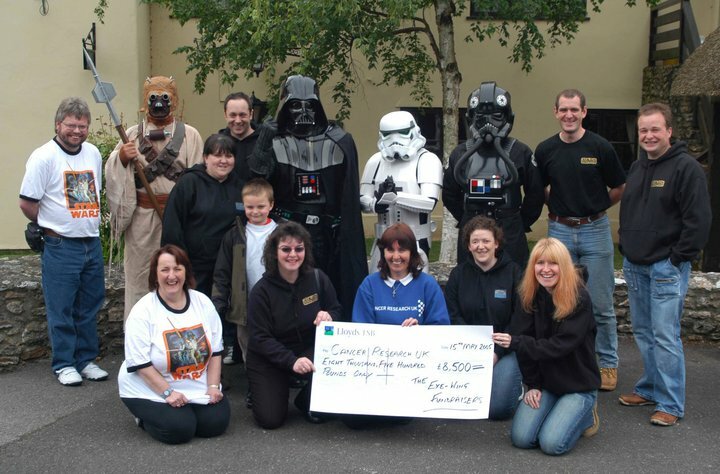 Formed over 15 years ago by a group of friends who all had an interest in Sci-Fi films and TV, when one of the group fell ill with leukaemia we decided to raise some money to help fund research, and so began the Exewing Fundraisers. We raise money for a nominated charity by organizing Sci-Fi themed events, collections and other activities, many celebrities from Star Wars and Doctor Who have kindly lent their support and appeared at our events. Our first formal fundraising event was Star Wars Day One, held in a pub and had 50 attendees, Star Wars Day Ten had over 1000 attendees and more recently Doctor Who Day One had over 1300 visitors! Amongst the charities we have supported are; The Exeter Leukaemia Fund, Cancer Research UK, The Devon Air Ambulance, Children’s Hospice Southwest and we even raised enough to fund a Guide Dog puppy and its training, we got to name him ‘Lucas’ after the creator of Star Wars, George Lucas! We have raised over £50,000 for good causes to date. The Exewing are all volunteers, the majority of the group live and work in East Devon, although we have members from all over the country who come together to help make the events the successes they are. Informal in approach we do have a committee structure, however generally we all do a little bit of everything and jobs get divided up equally. Our events are as much about providing a good value, family friendly day of entertainment, as they are about raising money and awareness for deserving causes. We spend a lot of time thinking about the sort of event we would like to attend and try to incorporate this into the ones we organize ourselves. Currently our main event of the year is held in the beautiful grounds of Pecorama, Beer, East Devon. We do hold smaller events and gatherings throughout the year, the website and facebook page are kept up to date with this information. We really do appreciate all the support we’ve received in the past, and hope to have in the future, thank you to all.